I’ll give this to Capcom, they sure picked an unusual bunch for their latest mobile initiative. Given the original game’s importance in Capcom’s history, 1942 Mobile ($1.99) made a certain amount of sense. It was their first big hit, and shooters tend to play well with the mobile audience. Ghosts ‘n Goblins ($1.99) is certainly a significant game but it wouldn’t be my first choice to adapt to touch controls. Capcom disagreed enough that the next game in the series is Ghouls ‘n Ghosts Mobile. The meat in that Arthur sandwich, however, might be the oddest choice of the lot. 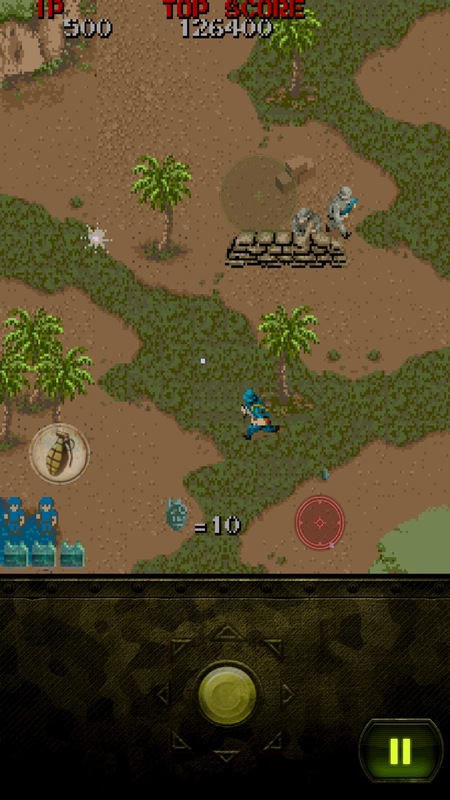 Wolf of the Battlefield: Commando Mobile ($1.99) is a technically-sound port of the game once known outside of Japan simply as Commando. It was a decent hit in its time, and it’s certainly an influential game, but it manages to suffer from the negative points of both prior Capcom Mobile ports. Originally released in the arcades in 1985, Commando was one of the first overhead run ‘n gun shooter that felt really good to play. 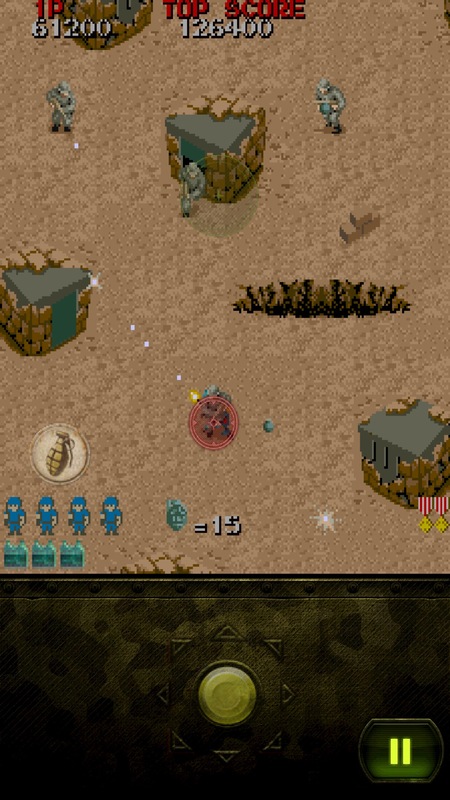 While the concept had been previously established in Taito’s 1982 title Front Line, that game was a little bit too slow and stiff to reach its full potential. Capcom’s take cranked the speed of the action, pumped the screen full of bad guys and projectiles to avoid, and gave players a character that felt good to control. While the game was relatively short, with only eight stages, it was unbelievably difficult, which gave it some lasting power. With Rambo and a Schwarzenegger flick whose name escapes me at the moment riding high in the cinemas, Commando was the perfect game for its time. 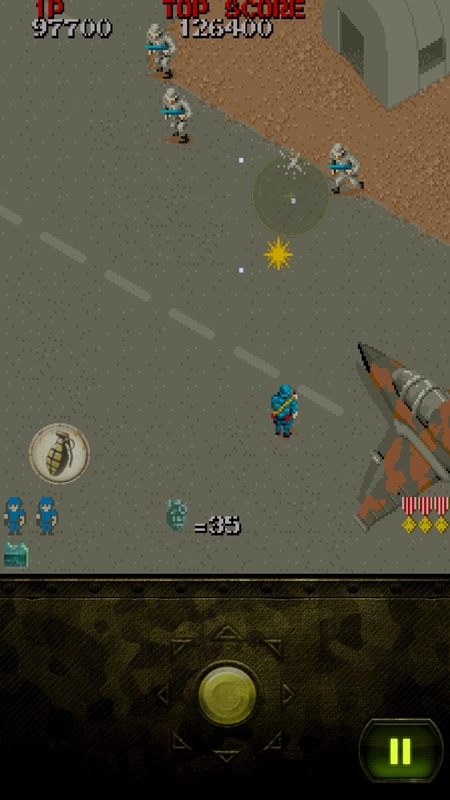 Its success spawned a small cottage industry of military-themed overhead shooters, including titles such as Ikari Warriors, Jackal, and Guerilla War. Curiously, Capcom never bothered to do much with the Commando franchise after that. There was one sequel called Mercs that released in 1990, and the NES version of Bionic Commando is presented as a spin-off, but the company was seemingly content to let Commando slip into the history books. The only other time it cropped up was in 2008, when Capcom released an ill-fated third installment on Xbox 360 and PlayStation 3. It’s not totally forgotten, mind you. Commando is a staple in most Capcom collections, which probably explains why it’s been selected for this particular line-up. As for how the port has turned out, the results are more or less the same as Ghosts ‘n Goblins Mobile. That is to say, this is technically sound translation of the arcade original that suffers from some control issues. It’s a bit puzzling here as you would think Commando would make an easy transition to touch controls, but there you have it. The default control set-up is by far the worst, requiring the player to touch on the screen in the direction you want the character to move. So if you want him to move up the screen, you have to lead him with your finger. In doing that, you have to block your view of what is ahead of you, which will get you killed in about half a second in Commando. There are two other control layouts that make more sense, though as in Ghosts ‘n Goblins, the game won’t remember your preference. You’ll have to select it again each time you fire the game up. The second option allows you to use an invisible virtual stick, while the third actually displays the stick. Your character will automatically shoot, and throwing grenades is placed on a separate virtual button or as a two-touch action. Anyone familiar with Commando knows how vital tossing grenades is, but I found that doing so frequently caused the movement controls to stop responding until I lifted my finger and put it down again. It’s almost always a fatal delay if you’re playing in Classic mode. As with the last couple of games they’ve released, Capcom has included two modes of play. Classic mode gives you the original in all of its “everything kills you in one hit" glory. You can make use of a continue feature to pick up from the farthest stage you’ve made it to before, which bumps the game’s difficulty down from nigh-impossible to extremely improbable. Capcom has also included a Casual mode that numbs the difficulty down to virtually nil. Your grenade’s impact point is shown at all times, and even the paths of enemy grenades are clearly marked. You also start each life with three bulletproof vests that allow you take additional hits. It makes the game almost trivially easy. If you play this mode, you’ll probably see everything in the game in about a half an hour, if that. So yes, pick your poison. 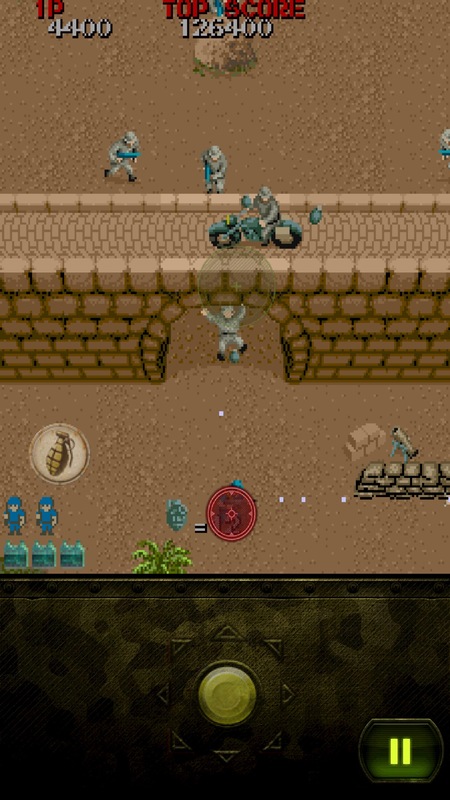 Commando Mobile is either too easy to appreciate or too difficult to enjoy, depending on which mode you’re playing. It’s still a pretty fun game, and if Capcom had put MFi support in the game, I’d jump over to Classic mode and have a grand old time of it. The control issues make Classic mode a real bear, unfortunately, so you’ll probably trudge over to Casual mode, stomp through the game, and wonder what all the fuss was about. That’s a sad outcome for what should have been a slam-dunk port of a real classic to mobile hardware and touch controls. Like their other recent releases, Commando Mobile supports leaderboards and achievements, but only through a Google Account. Once again, the extremely reasonable price makes it hard for me to say you shouldn’t even consider buying Wolf of the Battlefield: Commando Mobile. If you think you can deal with the control quirks, this is a good technical conversion of the arcade game. Provided that’s all you’re looking for, I can think of worse ways to spend a couple of bucks. Between the control issues, the relatively low amount of content, and the inconsistent difficulty settings, Commando Mobile is probably the hardest one of these releases to recommend so far, however.